UTV showed an episode of Up Close this week about the Primark Fire. 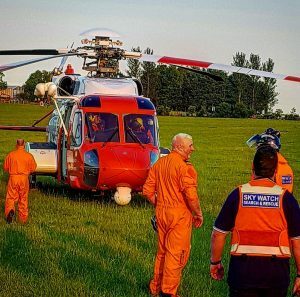 Sky Watch NI did filming after the fire for NIFRS and some of the drone footage was used in the documentary. 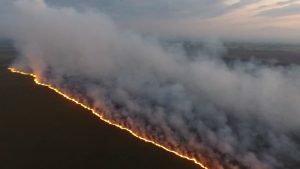 The drone footage can be found at the link below. 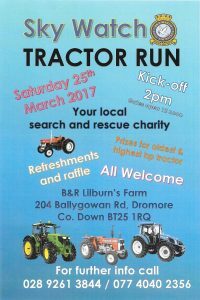 Saturday 24th March is time for our Tractor Run again, Gates open at 1100am and starts at 2pm. 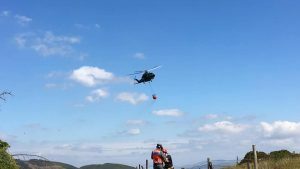 There will be an aircraft flypast weather permitting, bouncy castle, rodeo bull, food stalls and the main event the Tractor Run followed by the Contractors Competition. On a recent search we met this little fellow. He was out for a walk with his foster dad and from the picture you can see he was taking quite and interest in what we were doing. 2016 was quite a busy year for Sky Watch NI. The officers and responders have been working hard behind the scenes. The team is growing and the experience we have among the team is very varied but all are very experienced in what they do. 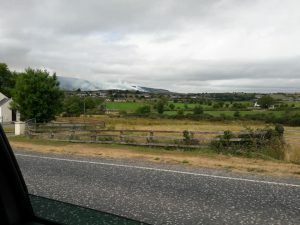 They have attended several courses to ensure their skills are all current and working on a more structured Sky Watch NI. The year was started with a Mountain Rescue Leadership Course and ended with Basic Life Savings Skills. The Leadership Course was an opportunity for some of our Responders and Officers to work and train with other Rescue Units from both North and South of the border. 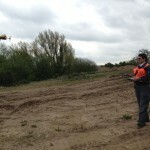 This was a weekend event and involved leading teams on exercises and ending with a major incident. 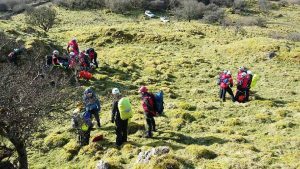 April saw us involved in a training exercise at the new Gobbins Cliff Path at Islandmagee training with the Coastguard. This gave some of the Responders a chance to experience being carried in rescue stretchers. 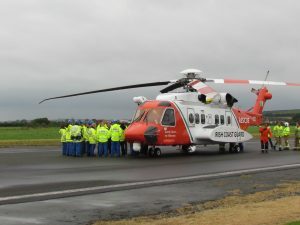 June we were working with Lough Neagh Rescue at Kinnego Marina, Oxford Island in a multi agency rescue exercise. 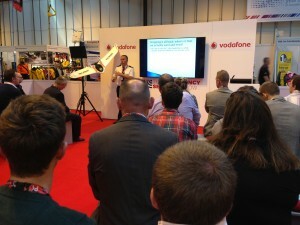 September we could be seen at the Emergency Services Show in Birmingham. We had a stall there and this gave the Response team a chance to look at what new equipment is available and to Network with similar units. what air assets were available to them. 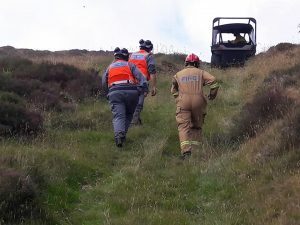 Responders also went for some off road training later in the month. December was very busy. Some of the team went over to represent the Northern Ireland members at the Sky Watch UK AGM at Sywell aerodrome. 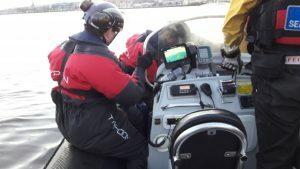 We also were at Kinnego Marina again testing some of our equipment in the water. 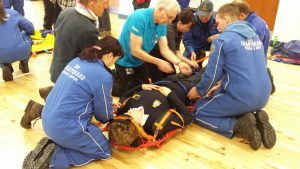 The year ended with the responders completing a Basic Life Saving course at Craigavon Area Hospital. Thanks to Bernie O’Connor the Resuscitation Officer, at Craigavon Area Hospital for providing this. In between this the responders have been involved in several searchs for both missing people and on occasions missing animals. 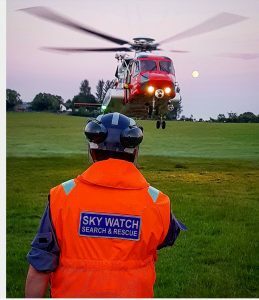 They have conducted several presentations to groups, we would like to thank the groups as all funds raised on these evenings are used to fund Sky Watch NI. What does 2017 hold for the team and the members? We have more training to complete to ensure we are the best at what we do. We aim to hold an open day later in 2017 to show our members what we can do. An opportunity to see the latest equipment and explain how those who wish to can become more involved. Events that are open to members and where we need additional assistance will be emailed to registered members. I hope this reassures you that we have been busy, growing and becoming more inclusive. The team are looking forward to what 2017 has to bring. 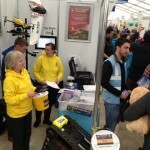 Our thanks once again to the organisers of the Balmoral Show for our superb stand and to our new and experienced volunteers, who kindly gave up their free time and work time to meet the public. 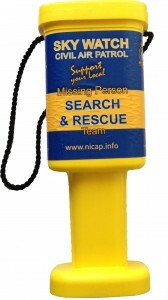 It was a very busy three days with hundreds of leaflets distributed and numerous kind donations. 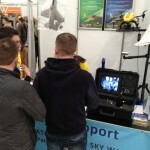 Lots of people stopped to enquire about our work and discover their temperature on our thermal camera. Our new schools programme proved popular with visiting schools too. 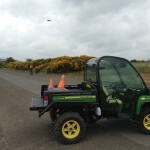 We would also like to thank Johnston Gilpin, Lisburn for the use of their Gator, a superb off road cart which allowed us to transport our heavy equipment around the site for UAV flights and quick redeployment of staff. 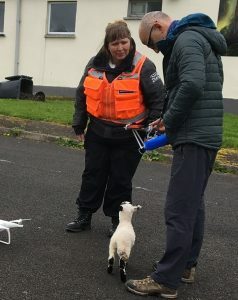 Skywatch was fortunate enough to be situated close to the seminar area when ACC Sean White of the Cleveland Police was due to give his talk on the use of UAVs at this years’ Emergency Services Show. 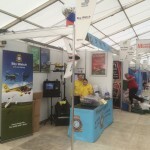 As a related prop, Skywatch was offered the opportunity to position their fixed wing drone beside the presentation screen which provided some excellent branding for the charity and even some media coverage, as seen in the October edition of Police Aviation News.